At Santiburi Beach Resort & Spa, all of your vacation dreams will come true! Relax and unwind under the tropical sun. 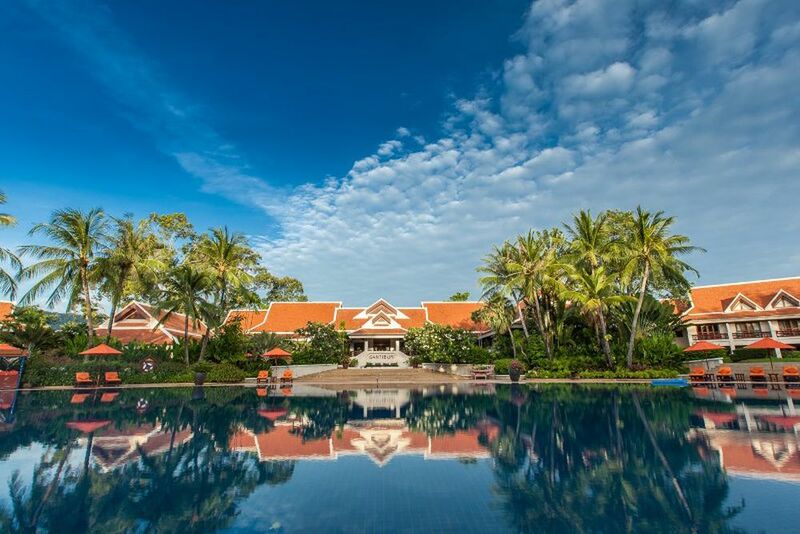 Nestled in a sprawling, tropical garden, the resort is the ideal haven of tranquility. Modern design meets local Thai decor. The cozy suites and villas leave nothing to be desired! 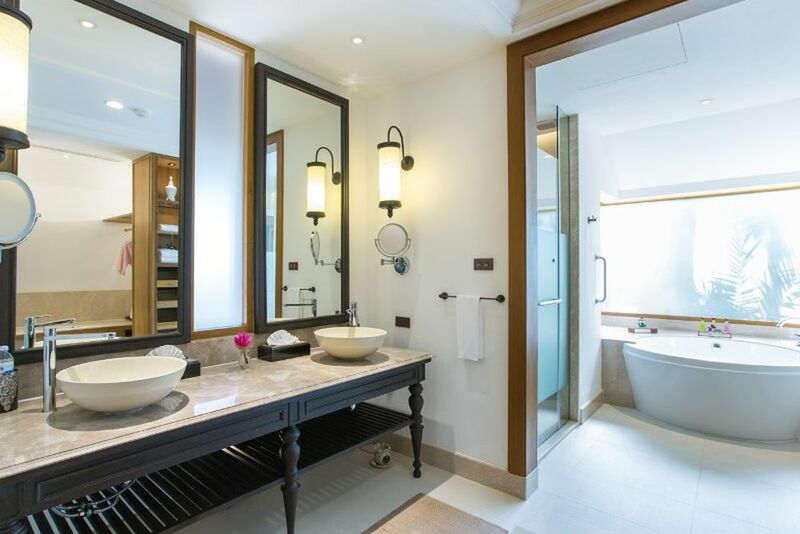 The luxurious bathrooms allow you to fully relax in a feel-good atmosphere. Do you want a villa right on the beach? The Deluxe Beachfront Villas are the perfect choice! Grab your favorite book and spend a relaxing afternoon by the 50-meter outdoor pool. Welcome to paradise! Golden sand, turquoise blue sea and shady palms - it could not be better! The beachfront Rim Talay Restaurant offers fresh snacks and creative cocktails with great ocean views. Guests can enjoy an aromatic afternoon tea and light snacks, which are served daily in the cozy lounge. Santiburi by Bhawa Spa offers traditional Thai treatments and world-class spa therapies. Golf enthusiasts can enjoy the nearby 18-hole championship golf course. Want to stay active during your vacation at Santiburi Beach Resort & Spa? 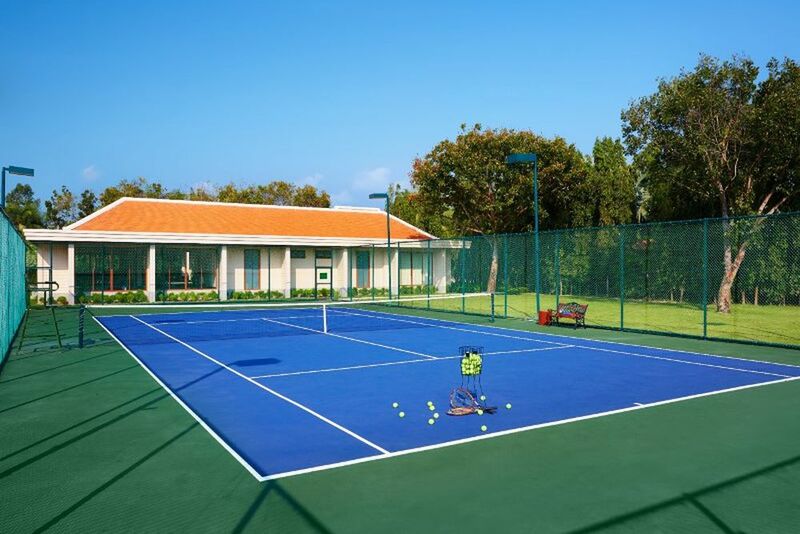 Browse through the generous range of sports and spend great hours on the tennis court or on a sailing trip! 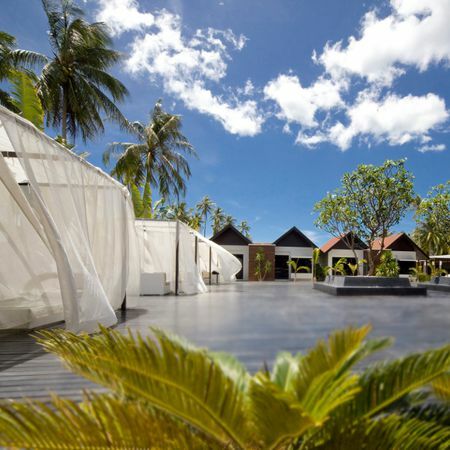 Santiburi Beach Resort & Spa is nestled on the idyllic Mae Nam beach. Escape to a tropical paradise where your toes sink into the golden sand of the private beach, stunning blue waters refresh you on hot days, and the tranquil palm trees sway in the breeze. Make all of your dreams come true for your next holiday adventure in Thailand! 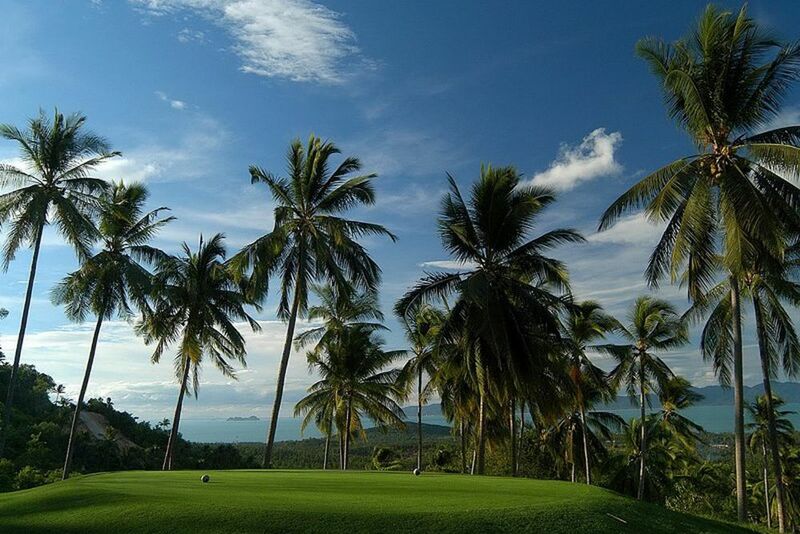 Santiburi Beach Resort and Spa is situated in the north of the dream island Koh Samui, embedded in 23-hectare gardens. 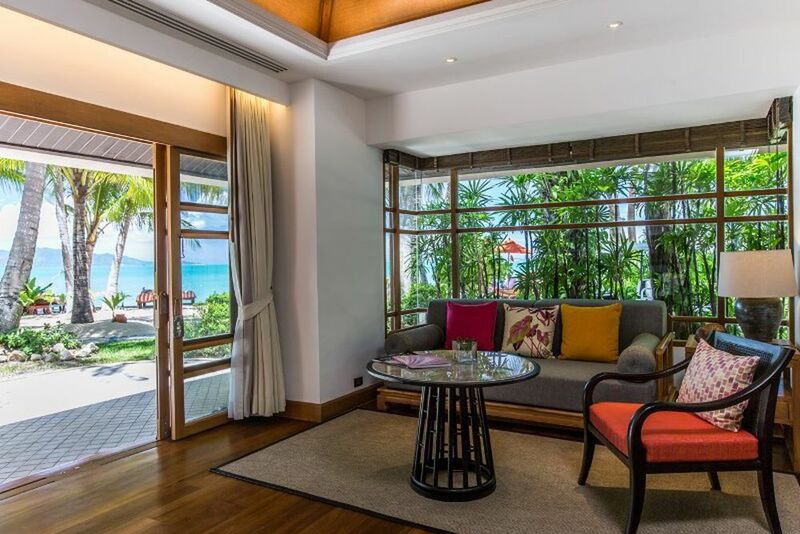 Enjoy its unique location, arrayed along 300 m of dazzling beachfront at Mae Nam Beach, Samui’s best kept secret and serene ‘North Shore.’ Newly renovated, the award-nominated luxury hotel is part of the "Small Leading Hotels" group. 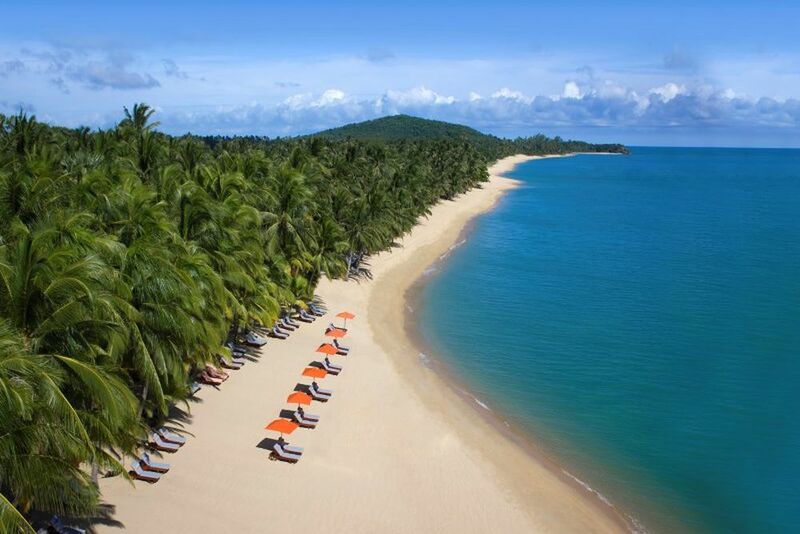 From the private paradise of the half-moon bay to the full expanse of champagne sands dappled with the shade of 600 towering coconut palms, Mae Nam’s warm, calm waters and gentle sloping beach are ideal for family frolics and intimate moments for romantic couples. "Santiburi" translates to peaceful town, and promises relaxing moments far from city bustle. 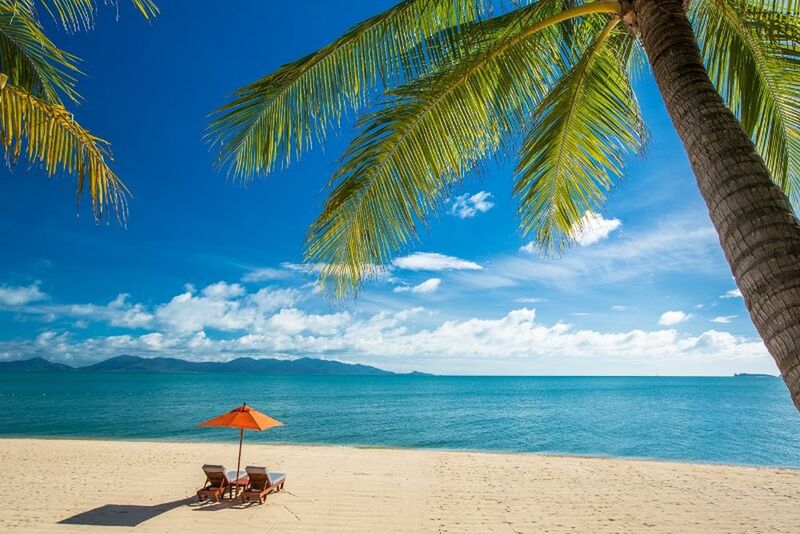 Koh Samui Airport is just 15 minutes away. 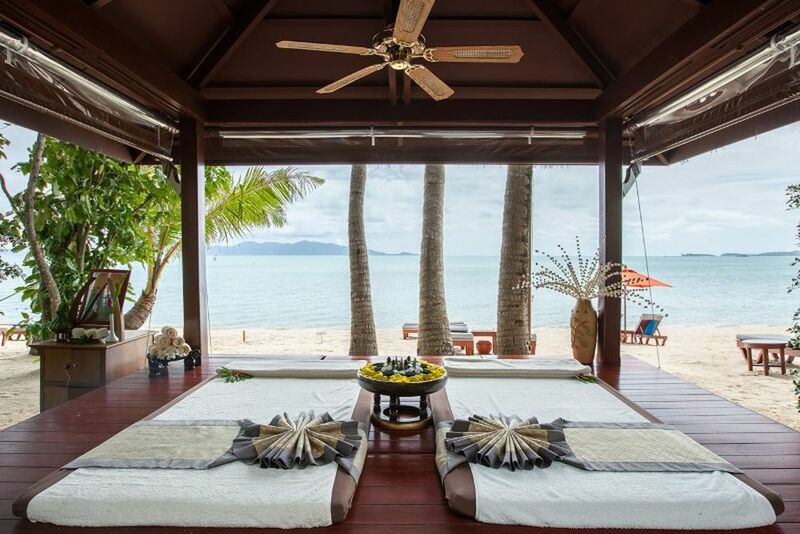 Santiburi Samui Beach Resort is a paradise on earth! Blooming with tropical flowers and trees, the luxurious villas and suites serve as their own individual haven that offer ultimate peace and privacy. 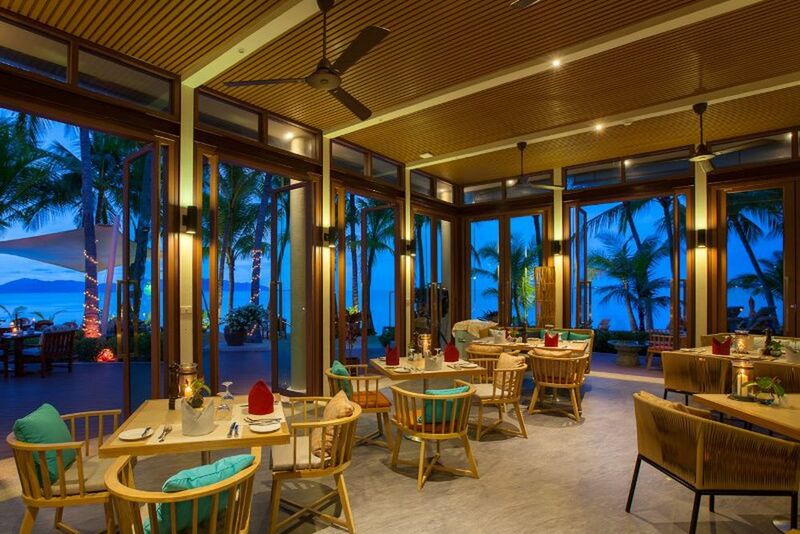 All of the restaurants at Santiburi allow guests to enjoy a refined yet relaxed atmosphere, with cuisines including global favorites and authentic Thai recipes. Have a hearty start to your day at Vimarnmek, the breakfast room. Enjoy a vast array of items at the breakfast buffet. Enjoy casual garden dining accompanied by refreshing cocktails and the cool paradise breeze at the Poolside Bar. You can also enjoy sophisticated snacks and beverages at The Lounge. Experience an authentic taste of Thailand in a casually elegant environment at Sala Thai, and a view of the Maenam lagoon, fresh snacks, creative cocktails and diverse dishes for brunch, lunch and dinner at the beach restaurant Rim Talay Beach Bar. Visit the lounge at around 4pm for an afternoon tea and Thai specialties. Or taste an aperitif before dinner and simply relax, perhaps with your favorite book or the newest newspaper. Experience one of Asia’s largest, most spectacular free form pools! It is 50m by 25m - one of the biggest resort pools in Asia. At the Kids’ Club, the younger guests are professionally looked after while you enjoy one on one time with your partner. There is a children’s pool, a playroom, and a petting zoo. 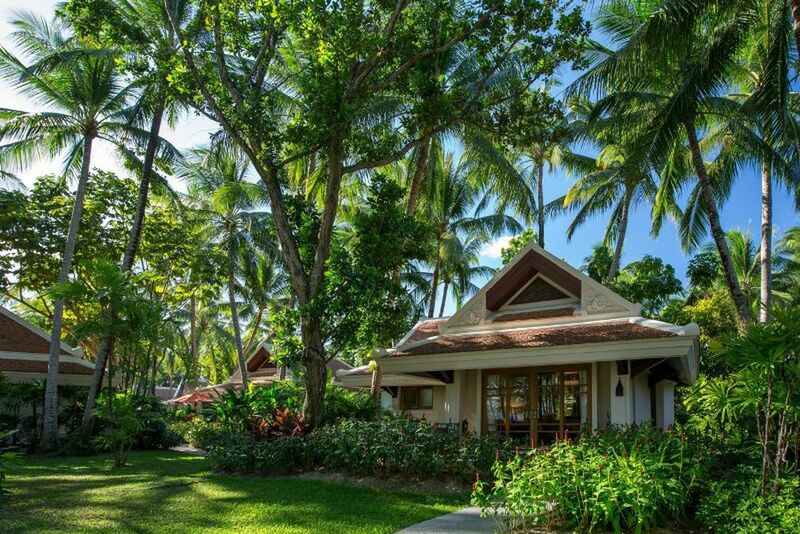 The 71 suites and freestanding villas are surrounded by verdant gardens and offer ultimate tranquility and privacy. 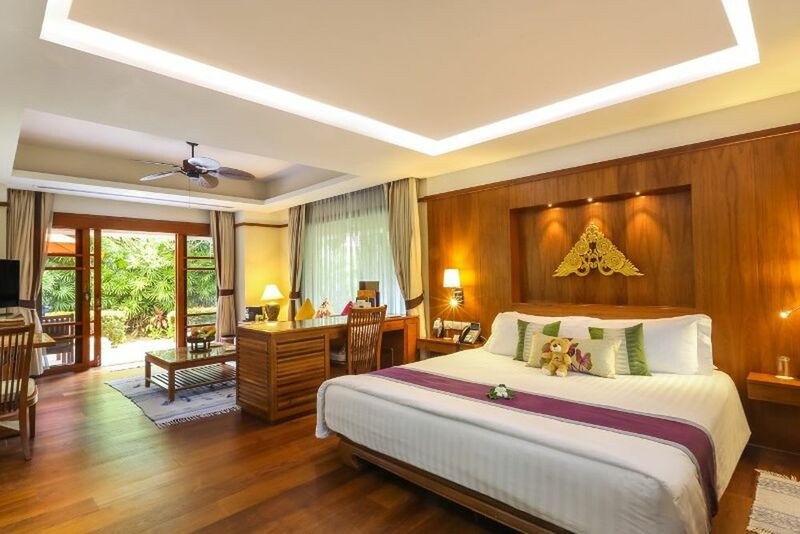 Each of the luxurious villas feature sleek, modern design, blended with warm, contemporary Thai decor. Amenities include state-of-the-art entertainment systems (i.e. TV, DVD player, a safe, coffee/tea making facilities & minibar), luxurious bathrooms (includes a rain shower and large bath), a lovely terrace and quiet climate control. One Bedroom Duplex Suite (55 m²) - These suites have views over the central courtyard and gardens from its tranquil balcony, a spacious bedroom and a separate living room with a sofa on the upper level. For a maximum of 2 adults and 1 child up to 14 years, or 3 adults. Deluxe Garden Villa (60 m²) - These villas create a peaceful ‘village’ ambience, surrounded by colorful tropical plants and linked by winding pathways. Each feature a spacious open-plan design, with a plush king-size bed and adjacent living area. For a maximum of 2 adults and 2 children up to 14 years, or 3 adults. 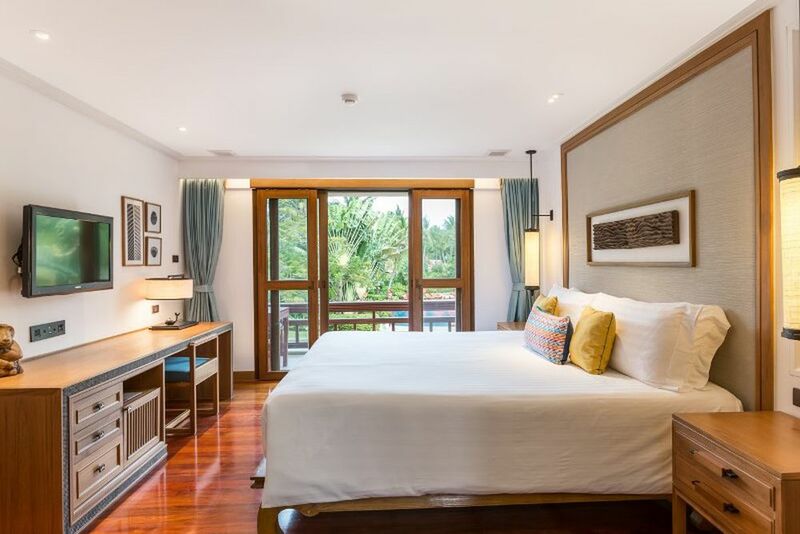 Grand Deluxe Garden Villa (61 m²) - Located on the front section of Santiburi’s luscious gardens, enjoy a peaceful ambience connected to the beach and the main building via picturesque, winding pathways. Each have an outdoor terrace with seating, an open-plan, a luxurious king-size bed and a living area. For a maximum of 2 adults and 2 children up to 14 years, or 3 adults. Grand Deluxe Garden Villa with Plunge Pool (121 m²) - Nestled in the beautiful gardens, these villas feature their own private courtyard with a plunge pool, a plush king-size bed, and an open-plan living area. For a maximum of 2 adults and 2 children up to 14 years, or 3 adults. Deluxe Beachfront Villa (62 m²) - These beach villas take up a prime position along the beachfront, just steps from the sea. Enjoy ocean views from your terrace or open up your curtains and let the views inside, waking up to see the sun rise over the ocean. These villas feature a sliding door that separates the living area from the bedroom, a king-size bed, and a dining table for two. For a maximum of 2 adults and 2 children up to 14 years, or 3 adults. 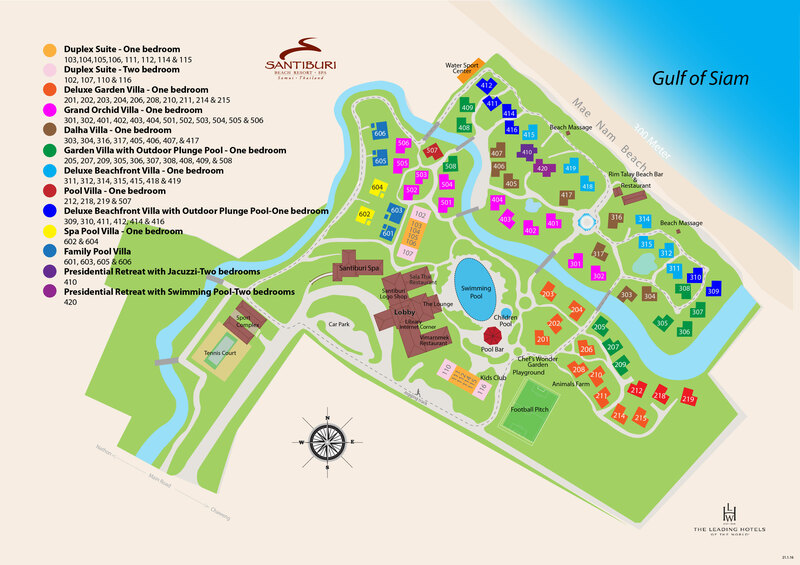 Further villas and suites available upon request. At the newly opened Santiburi by Bhawa Spa, enjoy relaxation at the highest level! Pamper your body with traditional Thai treatments and let your soul dangle with first-class spa therapies. Simply switch off reality and forget about the chaos in your everyday life. There is even a Kids Spa Package offered by the professional service! Overall, the award-winning spa area offers several treatment rooms and six freestanding spa villas. 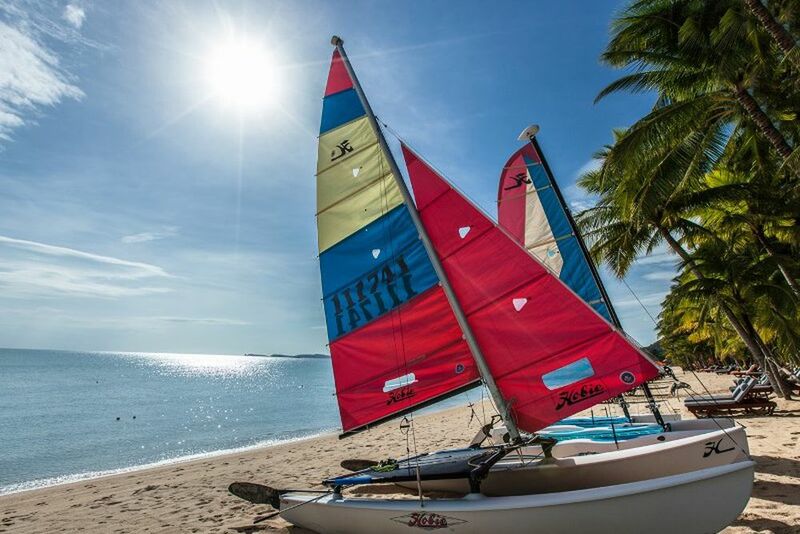 Sport enthusiasts will thrive when staying at Santiburi Beach Resort & Spa! Enjoy a work-out in the professionally equipped gym and try out one of the many on-site activities. Try a water sport, play football and tennis, head over to the 18-hole golf course (free shuttle buses every 10 minutes), or rent bicycles. The opportunities are endless! Free use of squash, football, tennis courts, etc. Valid during the travel period 09.01. - 31.10.2018. Can be combined with the Early Booking Special and Long Stay Special. 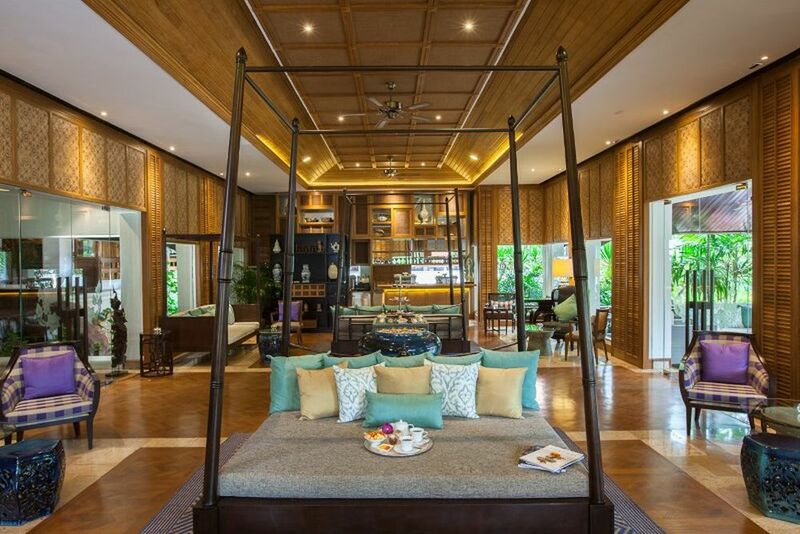 The majestic Aava Resort and Spa is Thailand’s best kept secret.